In our ceremonies at home in Jemez Pueblo, we have racer kachinas. 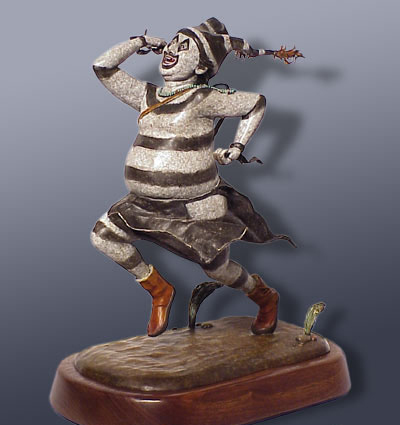 The koshares, like this one, enjoy teasing the kachinas and challenging them to a footrace. The koshare will keep egging the kachinas on, saying they are faster and can beat them. Finally, one of the kachinas will agree to the challenge. The two will line up at one end of the plaza and at the count of three, take off running as fast as they can. The racer kachina usually takes the lead early on, as they are the fastest. However, part of the blessing of the kachinas is to let others win, whether it is a koshare or a young child. By the middle of the race, the koshare begins to gain speed. Really, it is the kachina slowing down so the koshari can catch up. Everyone gets a good laugh watching the heftier koshares run. In the end, it always appears to be a close race and we cheer them both on, even though we know who is going to win. This is where the inspiration for this piece came. I wanted to capture the extreme physical movement of a big-bellied koshare in his efforts to win; his head tilted up to the left and his tongue poking out of the corner of his mouth in exertion. This koshare has just lifted off from the starting point. His feet have the slight inward turn of when a runner first sets in motion. Notice that his right arm and right leg are in sync. This is opposite of how we really run. When the koshares say or do things, it is a part of their ritual to always do things backwards or opposite of what they mean. I wanted to emphasize this aspect of their society. Also, you can see that by the direction his breechcloth and turquoise beads are flying, his strong side is his left. For balance, I gave him a small prayer bag on his right. The same goes for the vegetation; the smaller shrub is on his stronger side, while the larger is on his weaker. I like the effect this gives, with all things being complementary.